These crinkle cookies were intended to be special Valentine’s Day cookies for my kids, only they didn’t last until Valentine’s Day. In fact, they barely lasted one day. 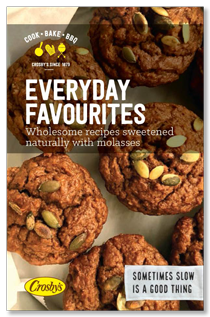 I stumbled across the recipe in the December 2015 issue of Canadian House & Home Magazine. I didn’t quite get to them over Christmas so I tucked the recipe in my Valentine’s Day folder. 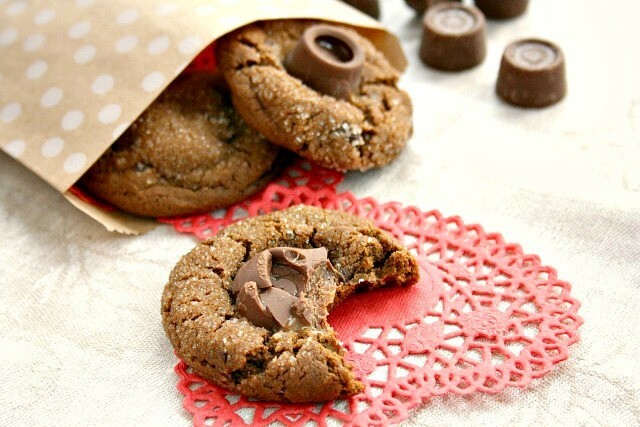 You can bake the cookies with the Rolos stuffed inside, or placed on top, or do a bit of both. Tucked inside the caramels are like a hidden treat, a throwback to the days when we used to have wax paper wrapped coins in our birthday cakes. 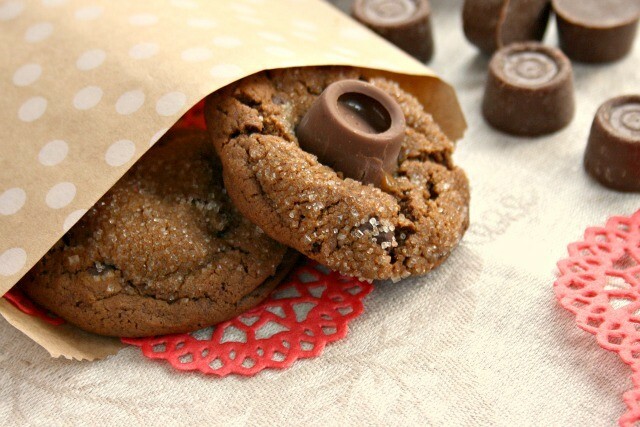 With the Rolos placed on top, the cookies look irresistible. The only drawback is that the cookies are then vulnerable to having the Rolos plucked off the top. Combine flour, spices, cocoa and baking soda in a bowl. In another bowl beat the butter and fresh ginger. Add the brown sugar and beat until well combined. Add the molasses and mix well. Stir the flour mixture into the butter mixture and combine well. Stir in the chocolate chips. Roll dough into 1 ½ inch balls, create a dent in the middle and push a Rolo into the dough. 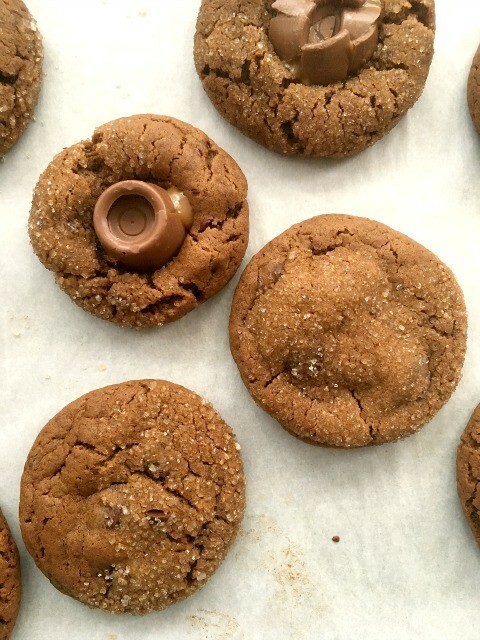 Reform the cookie around the Rolo and seal well and reshape the ball.  Dip or roll in sugar and place on a parchment-lined cookie sheet, 2” apart. Bake 12-14 minutes, until the surface cracks. Let cool. Roll dough into 1 ½ inch balls, dip or roll in sugar and place on a parchment-lined cookie sheet, 2” apart. Bake 10 minutes, remove from the oven and make a dent in the middle of each cookie with a melon baller or teaspoon-sized measuring spoon. Sit a Rolo in the dent and return pan to oven for another 2-4 minutes to finish baking. 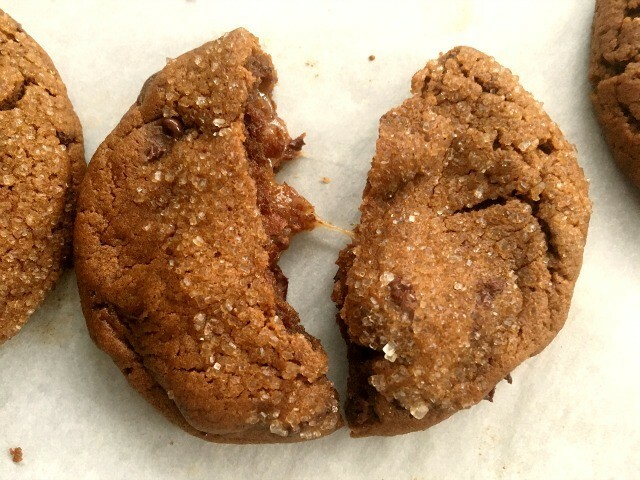 Have you ever taken a bite of something store-bought and thought to yourself: “I bet a homemade version of this would be off-the-charts delicious”? That’s how I feel about graham crackers and now fig newtons. 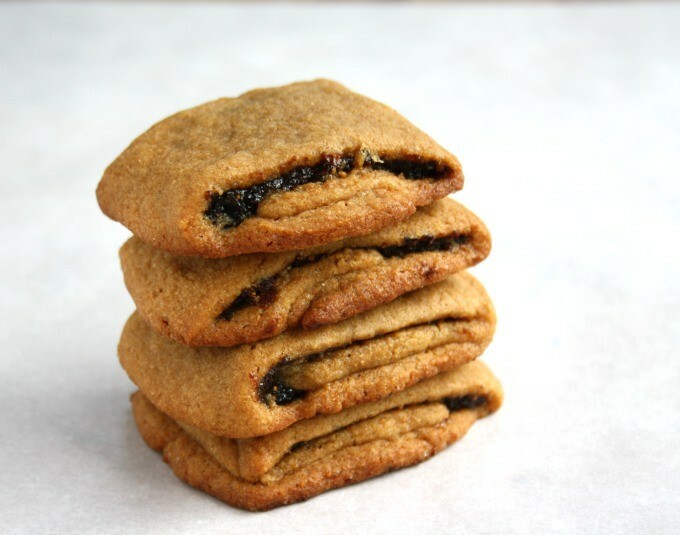 The cookie part of a fig newton can be a little pasty and lacking in flavour so the cookie itself ends up being totally dependent on the filling, which is pretty reliable. But what if you had a delicious, tender cookie to wrap around that filling? 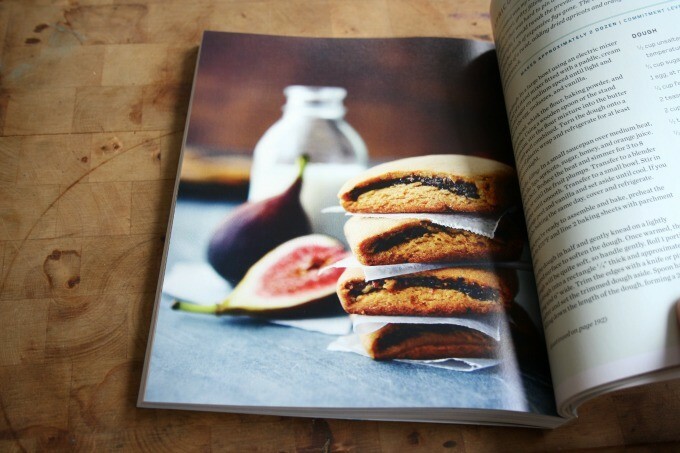 In her new book, The Messy Baker, author Charmain Christie takes the cookie and the filling up a notch to create an outstanding Fig & Apricot Newton that is more than worth the effort, even for non-fiddly home cooks like me. 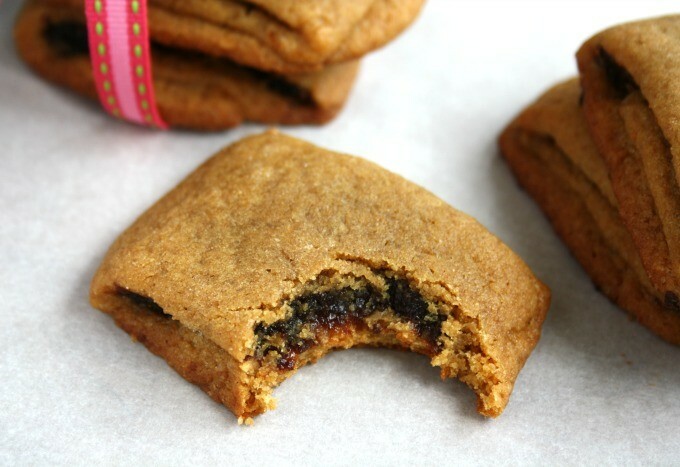 The fig and apricot filling is sweet, flavourful and not too thick, wrapped in a delicious, tender molasses cookie. I made just a couple of changes to Charmain’s original recipe: I omitted the orange zest in the filling since I loved the subtle orange flavour imparted by the orange juice in the filling and didn’t want to lose that figgy-apricot flavour. I also substituted molasses for the honey called for in the filling. Oh, and I omitted the salt since I used regular salted butter. Here you’ll see my version is a little messy, but delicious nonetheless. In a medium bowl cream the butter and sugar. Beat in the egg then the molasses and vanilla. Combine the flour and baking soda then add to the butter mixture. Scrape dough onto parchment paper or plastic wrap, gather into a ball, flatten into a disk, wrap and refrigerate for at least an hour or overnight. Combine the figs, apricots, sugar, molasses or honey and orange juice in a saucepan and bring to a simmer. Cook until fruit is plump, 5-8 minutes. Add vanilla (and orange zest, if using) and whirr in a food processor until smooth. Scrape into a bowl. Cut dough in half and roll each half into a skinny rectangle approximately 18” long and 6” wide. 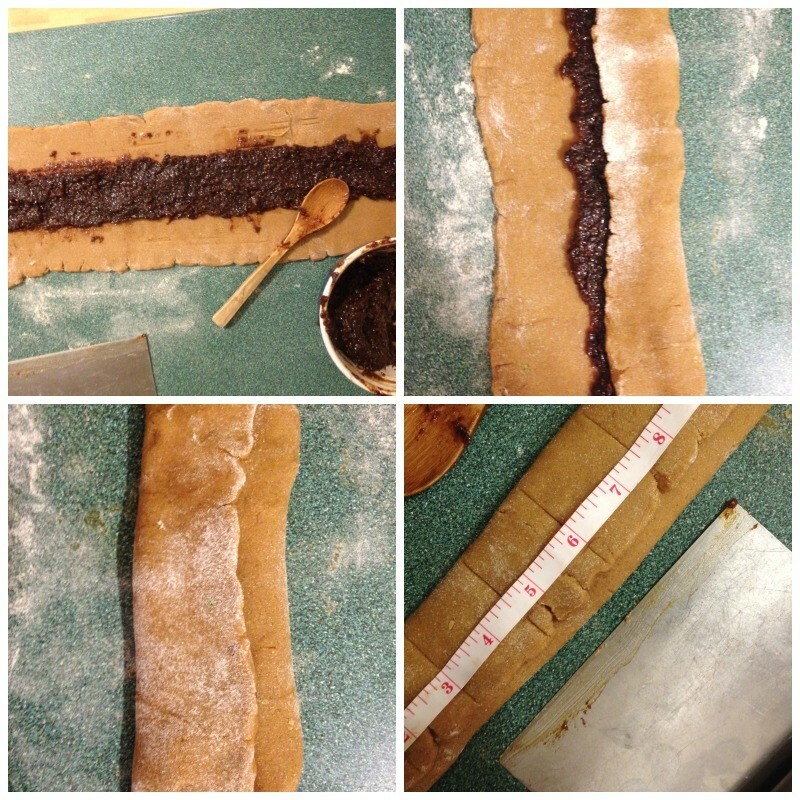 Spread half of the fig mixture down the centre of the dough, in a two-inch wide strip. Fold one side of the dough over the filling then the other. Cut into 1 1/2 “ bars and lay them seam side down on a parchment-lined baking sheet. Bake for 12-14 minutes (depending how soft you want them).